I recently made these snowflake pattern blocks templates as part of a new “school” system I am going to do with Smiley Man. Since Smiley Man is still pretty young (20 months), I don’t think he will be able to use these pattern blocks templates the “regular” way. However, he loves to play with pattern blocks and he likes having a template to put the pieces on. I did make these templates specifically for Smiley Man, but they also make a great pre k activity. 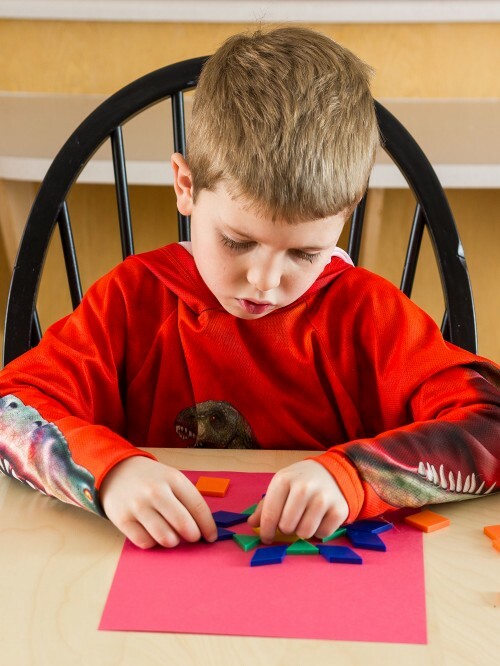 Little Bear loves working with pattern blocks templates and so do most preschoolers. I decided I should let Little Bear try them out and I am really glad that I did. I have been teaching Little Bear that every snowflake is unique. He didn’t believe that could be true, so I was able to pull out these snowflake pattern blocks templates at just the right time. I showed him how they all have the shape of snowflakes, but they all look different. He was fascinated. Since Little Bear loved these snowflake pattern blocks templates so much, I decided to do a few extension activities with them. 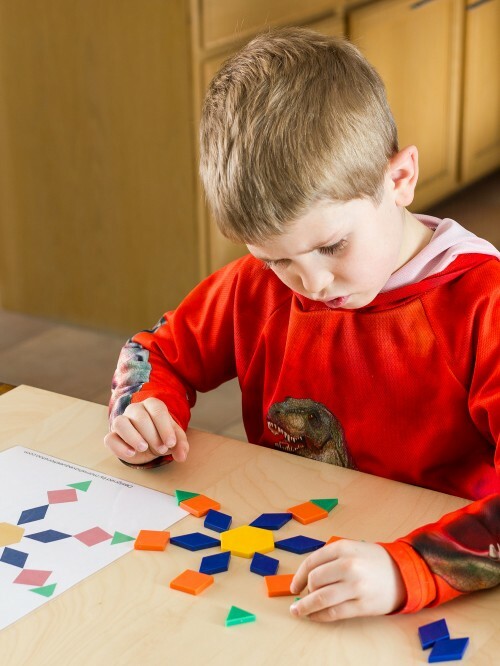 First, I had him make one of the snowflakes on a template by looking at the template and putting the pieces on a table, rather than straight onto the pattern blocks template. Then, I had him trace all of the individual pieces. I showed him that he just made his own template for pattern blocks. He thought that was really cool. Next, I had him make his own unique snowflake. We talked about how it had to have 6 points. Little Bear was really excited about this and enjoyed making his own snowflake. 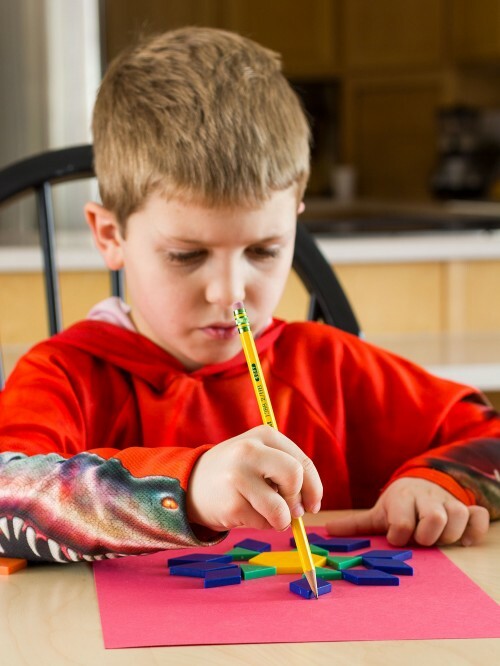 Once he made a snowflake that he liked, he traced all the pieces. Then, he gave me the new snowflake pattern blocks template that he made and I had to put the pattern blocks on in the right place. Finally, Little Bear colored the new pattern blocks template. He loved these extension activities. I think there will be more pattern block activities for us in the future. 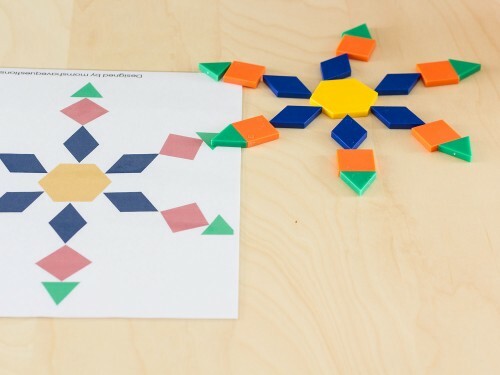 I am so glad these pattern blocks templates turned out to be such a fabulous pre k activity. 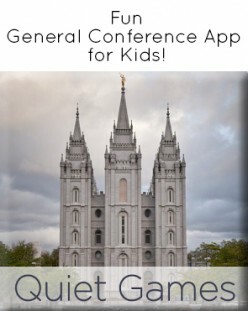 I know Smiley Man will also love playing with these templates when it is his turn, but I am glad that I let Little Bear play with them and I am extra glad that we found so many extension activities. 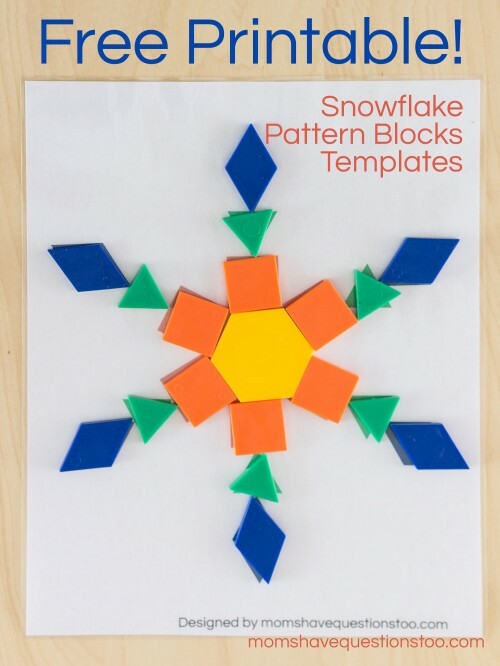 These snowflake pattern blocks templates are sure to bring your toddler and your preschooler lots of fun.